The TORCH features enclosed weatherproof cabinets to protect all your grilling and outdoor kitchen equipment. The SPARK is an on-the-go model that beautifully supports your grill and fits conveniently fits into any space. TORCH grill carts are available in 48”, 54” and 76” sizes, while SPARK grill carts are available in 48” and 54” sizes, both in a variety of colors to suit your outdoor décor. 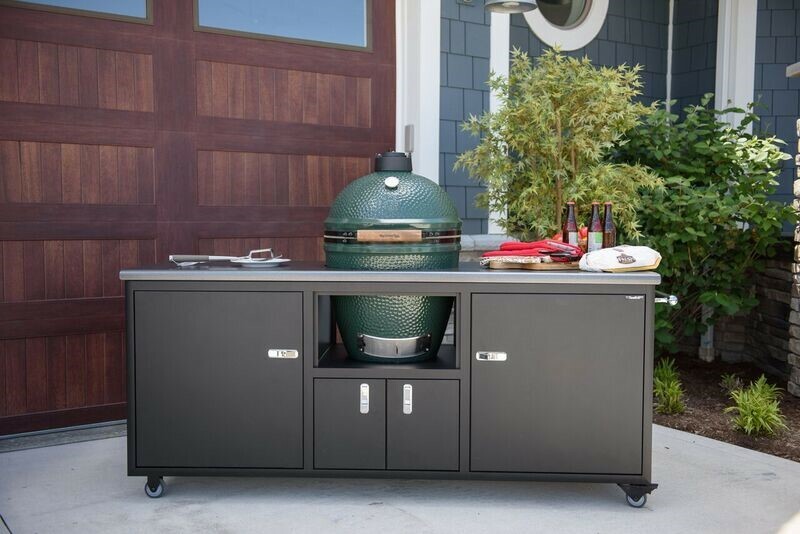 Designed to fit Large and XLarge Big Green Eggs, Challenger grill carts are made of weather tight construction with convenient towel bars and grab handles, plenty of work space and ample storage space for grill utensils, a cooler and anything else you might need to put on a super cookout that makes for great memories. Frame-less laminate doors with full-extension powder coated drawers and shelves, trigger latch in chrome or sliver powder coat, four 3″ ball bearing self-lubrication coasters (2 locking and 2 swivel) make Challenger grill carts hassle free and simple to clean.